The moment I arrive at Silk & Spice, I sense the contemporary feel of the restaurant. Thai iconography is not kitschy, and is used minimally. The large wine cabinet of glass and steel is a striking reminder of how modern the restaurant is, notwithstanding the Thai warmth arising from the wood finishings. It is a classy and elegant restaurant. While a choice of seating options abound, we opt for one of four traditional sunken tables which afford semi-private dining. However, it is the large windows which attract me. It is the window that will serve as the backdrop for my dinner this evening. 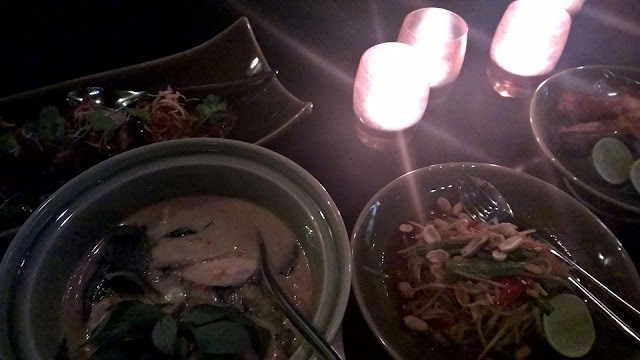 The question in my mind, as I am greeted by my waitress, is whether the dishes offer a contemporary twist or if they are classic Thai. However, as I am offered the menu, my waitress kneels beside my guest and me, and this traditional action tells me that notwithstanding the modern feel to the restaurant, the dishes are traditional. The evening starts off with an amuse bouche - a simple seared scallop, with a side salad lightly seasoned. 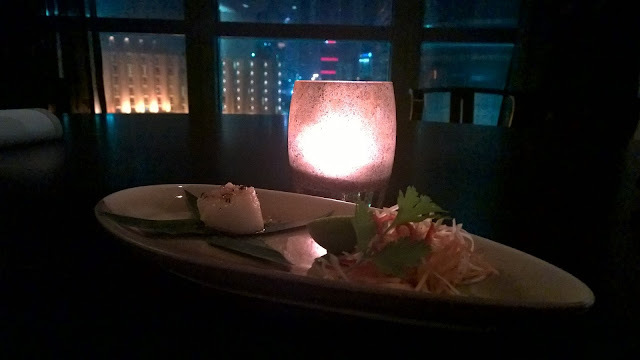 Chef Navaphon appreciates the subtle nuances of the scallop, and in the end, the dish is lightly flavoured, despite it being a Thai restaurant - magical. Soon after, we order soup - Tom kha gai . This soup is cleverly presented as a bowl within a bowl, with lemongrass and galanga leaves in the outer larger bowl, serving to infuse the experience with even more aroma. The soup itself is just beautiful. Generous pieces of ginger and chicken stand out while the blend of spiciness and sour is just perfectly balanced with sweetness. It is the latter that is quite a nice surprise because Chef is a bit more liberal than I would have expected. It actually comes together just right. Looking around Silk & Spice, I become aware of the mood. The general seating area is talkative, with bolder lighting. 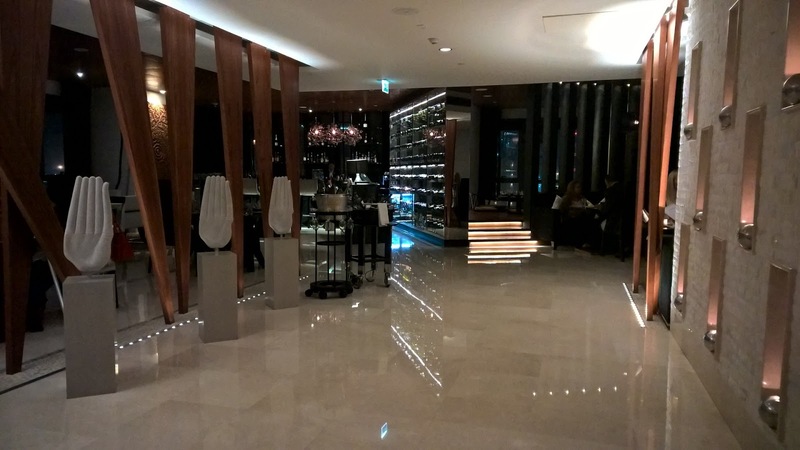 In contrast, the semi-private dining areas are more muted, with lighting significantly dimmer. I think it is important in a high-end restaurant to be able to offer guests that variation, and this restaurant does it exceptionally well. Incidentally, there is something very romantic about these sunken table rooms. The restaurant may not be marketed as a romantic option, but maybe they should! 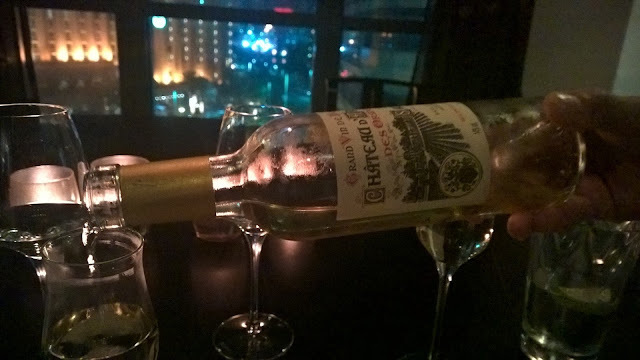 My reflections are timeously interrupted as my choice of wine for the night is presented. 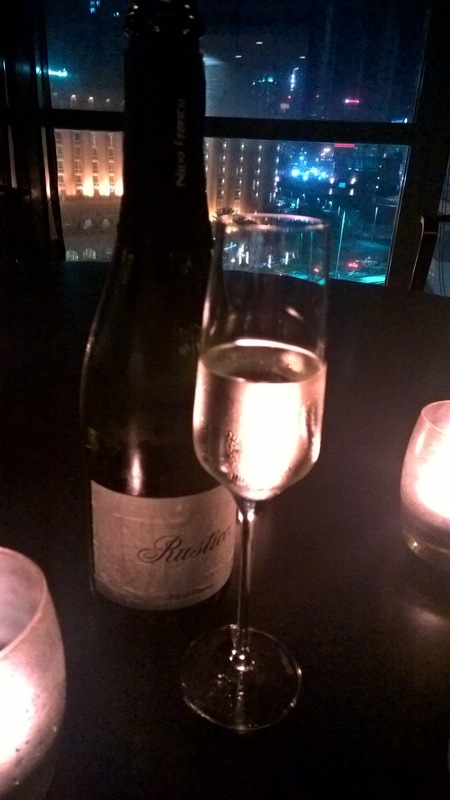 I opt for the Nino Franco Rustico Prosecco, a seemingly bold choice, but which is actually a sensible one if you like bubbly with your food. 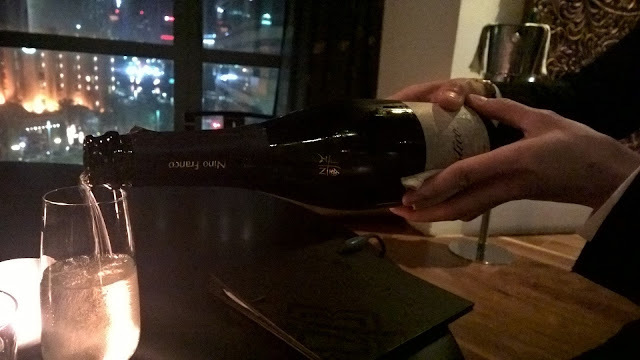 It is fruitier than a champagne and therefore, will balance the spiciness of the Thai dishes much better. With Prosecco growing more and more popular in key markets like the UK and Europe, it is only a matter of time before the Prosecco effect trickles down to us here in Abu Dhabi. 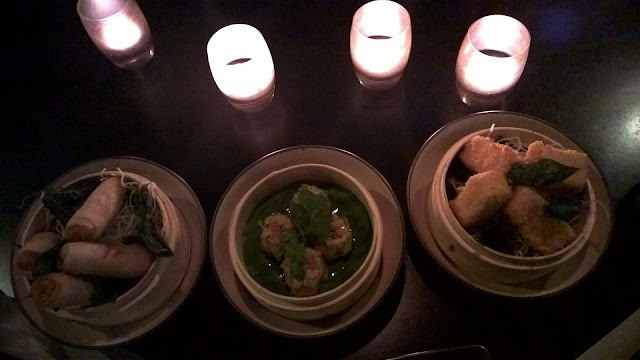 My guest and I have a trio of starters: The Thai style Dim sum with prawn and chicken, Por pia pak, crispy fried vegetable spring rolls and Tao hoo tord, deep fried tofu. The traditional nature of the restaurant is emphatically illustrated in these dishes. No surprises or twists - simply prepared the way you would expect them to be done. It is the fried tofu, though, that has bragging rights as appetiser of the night. The outer texture is so crispy - nothing exciting you might say, but the contrast with the tofu itself makes it memorable. While there are accompanying sauces, I refrain and have the tofu in all its delicateness of flavour. In anticipation of our main courses, we have a mango sorbet palate cleanser. Creamy sorbet blended with real pieces of mango - even something as simple as a palate cleanser is on a different level. For our main courses, we follow Chef's recommendations: Green Thai curry with chicken, Tiger prawns and garlic and a Green papaya salad. The curry is classic Thai, so wherein lies the attraction then? It is Chef's balance of flavours and the texture of those individual parts. As for the prawns, well, my guest and I both sing its praises - as with the scallops, they are not overwhelmed by Thai spices, and although garlic is decadently proportioned, these too do not usurp the prawns. The service is typically South east Asian - warm and from the heart, but I can't help thinking that the lack of Thai waiting staff is is a shortcoming. Competition is fierce among the city's top 3 Thai restaurants, and one thing you absolutely must have in creating that complete authentic Thai dining experience is Thai staff on the floor to complement the kitchen staff. Nonetheless, the service remains silky and smooth. Do you have that dish that you must always have when you try a certain cuisine? A dish that you will always have no matter where you are trying that cuisine? When I have Thai food, I simply must have the Khao Niaow Ma Muang or mango sticky rice to you and me. 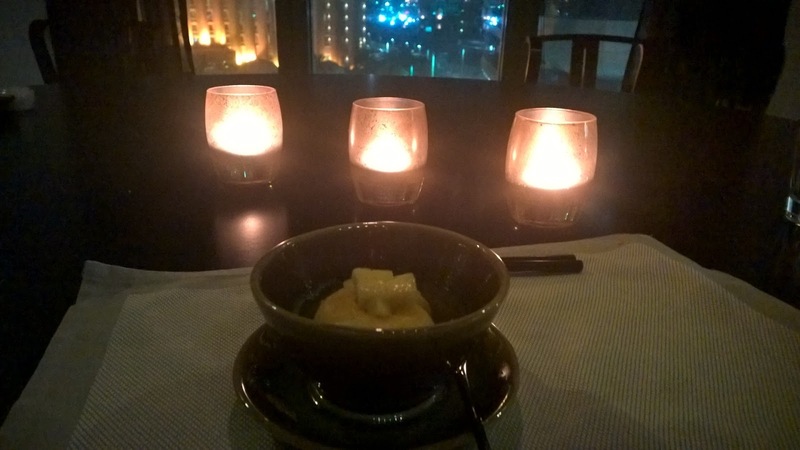 The mango and the sticky rice are both key, and when mine is served, I am wowed by the presentation. 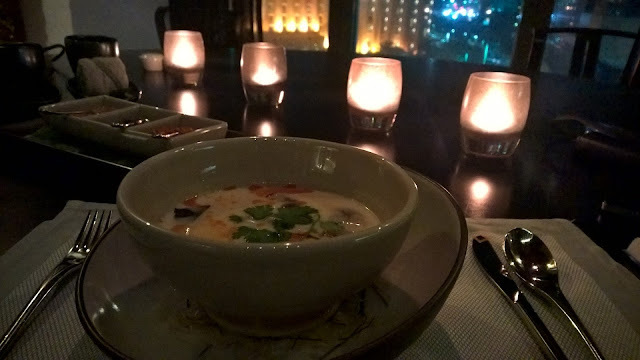 It is, along with the Tom kha gai the most creatively presented. But is here where it is not merely about creativity but also functionality The dish is served in a metal pot, placed on a flame. Of course! You want to ensure that the rice does not become too hard too quickly. With the ice cream on top, the juxtaposition is obvious, but warrants mentioning. Finally, coconut shavings bring texture over and above that brought by the real mango pieces. A top dessert in every respect. Silk & Spice is deservedly among the city's top 2 Thai restaurants. It is one thing to do traditional dishes, but you have to do them well, and that is what Chef and his team achieve here. 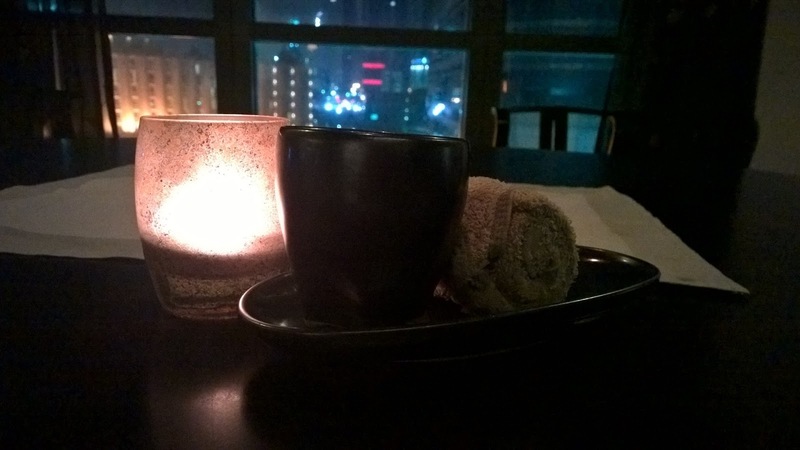 It has all the elements of unwittingly creating a romantic evening, with certain seats near the window and indeed the sunken table rooms offering city folk something very romantic. Finally, dishes are served in a classic way, so traditionalists will enjoy the experience. 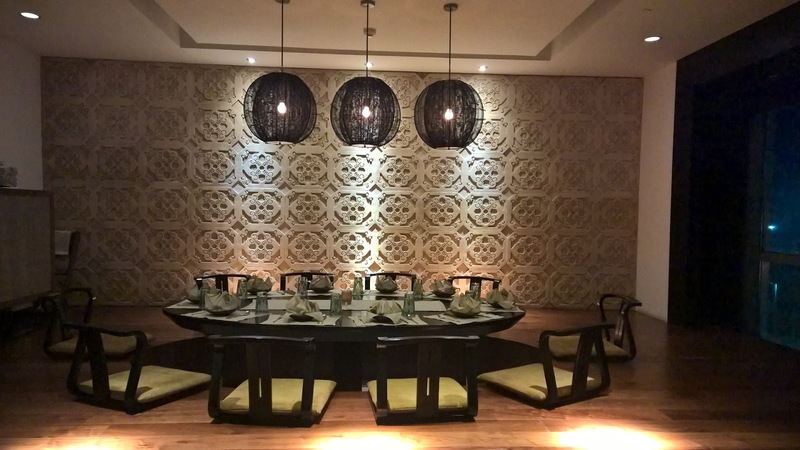 Silk & Spice offers the traditional in its menu and modernity in its gorgeous setting, a lovely combination. Meal for two - average 300 AED excl drinks. 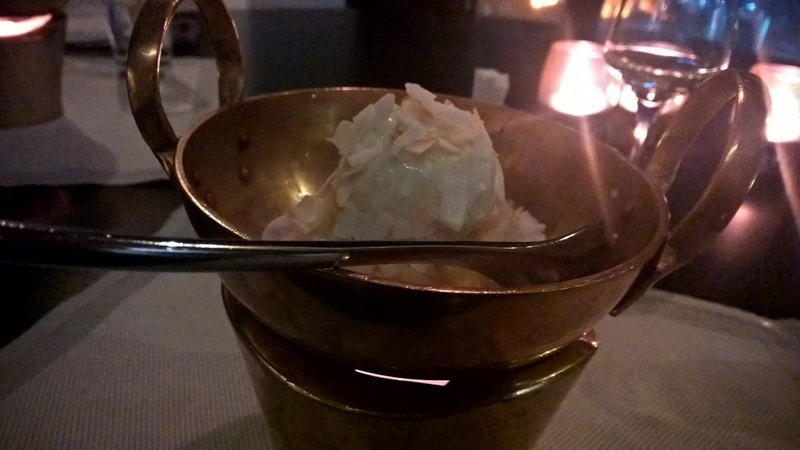 Disclaimer: I visited Silk & Spice courtesy of the Sofitel on the Corniche Abu Dhabi hotel.